Following Bananaman and Eugenius, here’s another in what’s becoming a trend: the comic book-based musical. But while those two shows focused on the superhero, Fanatical comes at it from a different angle. It’s set at a comic convention at which a group of cosplaying super-fans are eagerly awaiting the arrival of Scott Furnish, creator of sci-fi caper Angel 8. While Matt Board’s piano-led pop songs aren’t all remarkable, nor are they particularly well sung – there are way too many wayward melodies, and a couple of imprecise ensemble moments whose bum notes are all too audible – they are tightly written and stuffed with clever lyrics. Look What I Made is a highlight, showing in a really lovely way how much creativity comes out of fandoms. That’s one of the great things about this musical: it respects the sorts of fans that are usually demeaned. There’s clearly a lot of love here. It’s also very fandom-literate with nods to things like Geocities and Portal. It’s also very inventive, full of references to plots and lines from non-existent episodes. The characters are strongly written and nicely performed. 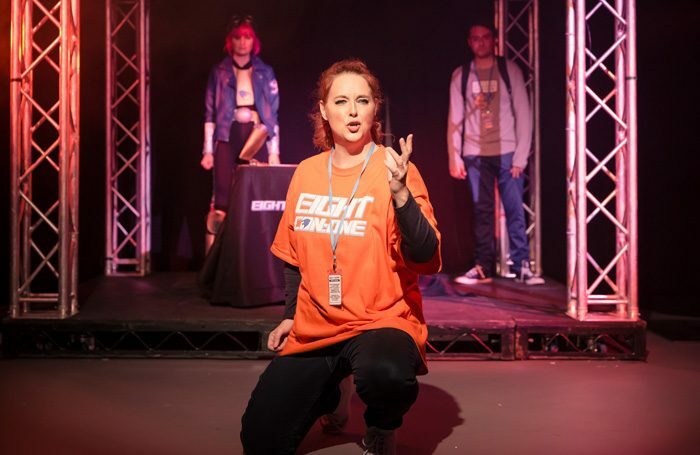 Eddy Payne, as awkward adolescent Baxter, provides some of the best comic moments and Sophie Powles is great as Andra, the show’s moral compass. Stephen Frost is something of an unrestrained presence as Scott Furnish, but he’s very entertaining. One of best things about the show though is PJ McEvoy’s all-encompassing design. The detail and the consistency are extraordinary, from mocked-up comic book covers in the programme to the designs of each character, as well as the costumes that have been made to look like budget cosplay versions of their ‘real life’ counterparts. Even if the sci-fi is too lo-fi at moments, Board and book writer Reina Hardy have created a really well-developed world here – one it’s easy to be a fan of.